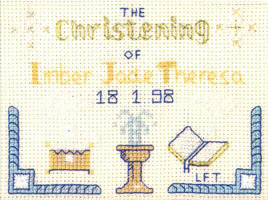 A petite Christening Sampler to commemorate a Baptism for a new member of the family. Delicate mauve garlands are sprinkled around gleaming candles and a font. The babe is suspended above by cheeky cherubs. Glistening threads are created with the use of pearly filament. The names and date and the church are added with the alphabet provided. A petite Christening Sampler with delicate mauve garlands sprinkled around gleaming candles and a font. Glistening threads are created with the use of pearly filament. This Petite Christening Sampler cross stitch kit has only the best quality materials ~ Zweigart fabric, DMC thread, metallic threads, needle. A full alphabet is provided to add names, the date of the Baptism and the name of the Church. This Petite Christening Sampler is from the Decorative Textiles collection. It forms one of a range of christening cross stitch samplers and cards. Christening refers to the naming ceremony (to christen means to give a name to) where as baptism is one of seven sacraments in the Catholic Church. Babies are baptised to welcome them to the family of the Church. In the ceremony water is sprinkled on the baby’s head as a symbol of new life and of being washed clean from sin. Parents and godparents promise to bring the baby up in the Christian faith following the example of Jesus Christ.